Like I said in yesterday's post, I'm not really into holiday baking. But that doesn't mean I don't have a favorite Christmas cookie. I most certainly do! And I love it so much, I make it year-round. I made it this weekend and will likely make more today. Yeah. You caught that. It's Tuesday and the entire batch is history. This year, I've tweaked the classic recipe to (never home)maker-perfection. If you haven't caught on yet, I'm really into using oat flour and maple syrup. 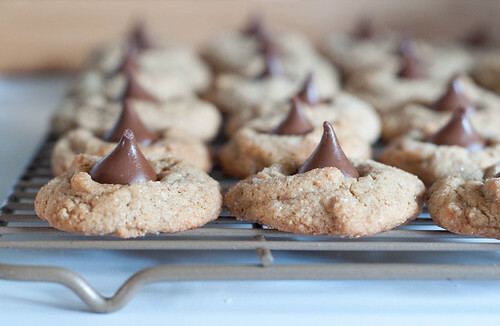 The inclusion of these ingredients in this recipe yields a heartier, healthier holiday treat. Cream together the butter, peanut butter, maple syrup, sugar, egg replacer (and water), and vanilla extract. About 5 minutes, until super fluffy. In another bowl, whisk together the whole wheat flour, processed rolled oats, baking soda, and salt. Add to the wet ingredients and mix until well combined. If dough is really wet, add a bit more flour -- 1 tablespoon at a time. Scoop out tablespoon-sized rounds and roll them in the sugar (I put my extra sugar on a plate). Place on the cookie sheet, spacing about 2 inches apart. Bake for between 10 and 12 minutes, until golden. Then top each with a chocolate kiss. Repeat with the rest of the dough. Recipe makes about 2 sheet of cookies. What's your favorite holiday cookie? And if you posted a recipe to it on your blog, feel free to share in the comments section! I'm always looking for new recipes to try.